12 Hours of Sebring 1965, by Friedman/Hurst. Hard cover. Superb book about this rain drenched classic battle between Ford, Ferrari, Porsche and the winner: Chaparral. Concept, right hand pages (mostly b/w) photographs of Friedman, left hand pages short notes, quotes from participants, press releases, etc. Rich romantic atmosphere. Extensive statistics. Very nice to have. Chevrolet = racing..? Fourteen years of raucous silence! !, by Paul van Valkenburgh, published in 1972. Hard cover. Chaparral plays a big part in this classic book. 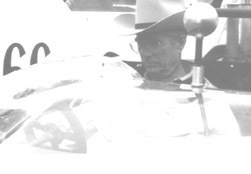 One chapter is dedicated to the Chevrolet/Chaparral connection. Thriller material! When I read this book in the mid Eighties I was flabbergasted. It was most sought after for a long time. The good news is: this book is available again! And Paul has published an index on the internet as well. Thank you very much! Chaparral, Complete history of Jim Hall's Chaparral Race Cars 1961-1970, by Richard Falconer and Doug Nye, published in 1992. Hard cover. The book we had to wait for, for more than 20 years. Fabulous book! A 'must have' for all Chaparral enthusiasts. Much history about all the five Chaparral 1's also. No information about 2K however. Pictures, technical drawings, stories, statistics, etc. Foreword by Denny Hulme, 'the enemy'! That says something. Chaparral, Can-Am & Prototype Race Cars, by Dave Friedman, published in 1998. Hard cover. Great book! A 'nice to have'. Concept: pictures with captions. Chaparral, The Texas Roadrunner, a Japanese book published in 1997. Hard cover. Suuuuuuuuuper! From 2A to 2K. Pictorial concept, so if you can't read Japanese, there is still a lot to enjoy. Captions in English. It was rather expensive and I don't know if it is still for sale. From every car there is a side view scale drawing and many large front/back/side/threequarters/detail photos of the restored and not yet restored cars at Rattlesnake Raceway. Veeeeeeeery good material for modellers. Chaparral, Can-Am racing cars from Texas, by Karl Ludvigsen, published in 2002. Soft cover. Concept: every page a picture with caption. Lots of unknown b/w pictures. Very nice for Chaparral addicts. Can-Am, by Pete Lyons, published in 1995. Hard cover. This is essential stuff for everybody who wants to know ALL about the golden years of CanAm racing 66-74. CanAm Photo History, by Pete Lyons, published in 1999. Hard cover. This is another great book by Lyons. Contains not only new photos, but also much history and interesting interviews with drivers (like Surtees), team owners and Jim Hall of course! Can-Am Cars 1966-1974, by David McKinney, published in 1999. Soft cover. Rather nice. But I found some mistakes and the side view drawing of the 2E seems not too accurate to me. Some obscure pictures though. Can-Am Racing Cars 1966-1974, Compiled by R.M.Clarke, published in ?. Soft cover. Overprints from CanAm related articles from magazines like Autosport, Road & Track, Car & Driver, etc. As good as the magazines are! Much about Chaparral of course. American Road Race Specials 1934-70. Glory Days of Homebuilt Racers, by Allan Girdler, published in 1990. Soft cover. Old Yallers, Cunninghams, Scarabs, Cheetahs, Bocars, Chaparrals and the people who created them. Reads like a novel! Indianapolis 500 yearbook, by Carl Hungness Publishing. Edition 78, 79, 80, 81, the Chaparral Lola and Chaparral 2K years. Soft cover. Good series. Lots of pictures, much storytelling, statistics. Nice to have. A good picture of what the Indy 500 is all about. The PPG Indy Car World Series1981, by Gordon Kirby, published by Competition Images, Inc., 1981. Soft cover. This is the first edition of this Indy Car World Series Annual. Warning: it's not about the 1981 season but about the 1980 season when Chaparral's Johnny Rutherford became the first CART champion. Nice book. I don't know if there was a series after this one. Cars in Profile No 4 The Chaparral 2, 2D and 2F, by Pete Lyons, published by Profile Publications Ltd., in 1972. Soft cover booklet. Series of booklets about racing cars like Ferrari P4, Jaguar D, Porsche 917. Adequate information about The Glassfibre Series. B/w photos and full colour 2F drawings. I think I'm very lucky to have this one. American Racing, Road Racing in the 50s and 60s, photos by Tom Burnside, text by Denise McCluggage, published by Könemann Verlagsgesellschaft mbH, 1996. Heavy weight table top book. Concept: pictures/captions (German, English and French) and a little history at the beginning of each chapter. The book contains absolute top photography (all b/w) by Tom Burnside. F.i. chapter Sebring 65. Just great!